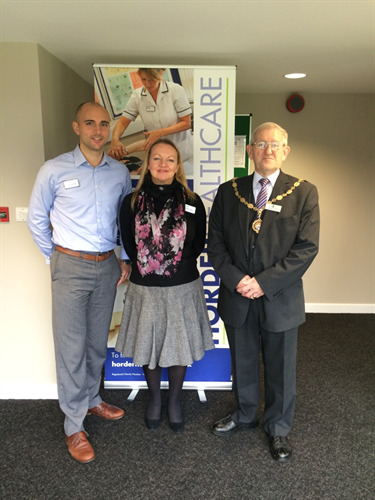 On 17th November the Mayor of Seaford, Mark Brown, visited the newly opened Horder Healthcare Centre in Sutton Road, Seaford. He was given an informative tour of the building by Horder Healthcare’s Karen East, Marketing and Business Development Manager and Matthew Carr, Musculoskeletal Clinical Quality Manager. After the tour of the building, the staff discussed with the Mayor their current services which include physiotherapy and wellbeing classes, along with orthopaedic consultations, pre-assessment and diagnostics. Mayor Brown said “It was a pleasant surprise to see how well the building has been refurbished, having seen the positive improvements from when I last visited to receive therapy at the old Day Hospital myself some years ago for a broken ankle. Horder Healthcare currently provides the local community in Seaford with orthopaedic and MSK services on behalf of the NHS from its new local clinic on Sutton Road and continues to work closely with commissioners on the possible delivery of future services.